NSW had swept all before them in the pool stages, but the final against Queensland proved to be no walk in the park. In the end it took a 92nd-minute Ash Hewson extra-time penalty for NSW to lift the inaugural Buildcorp Super W title, 16-13 over Queensland. In a game that could not have been scripted any better, there was no gap between the teams on the scoreboard after 85 minutes and the match went into golden point extra-time at 13-all. 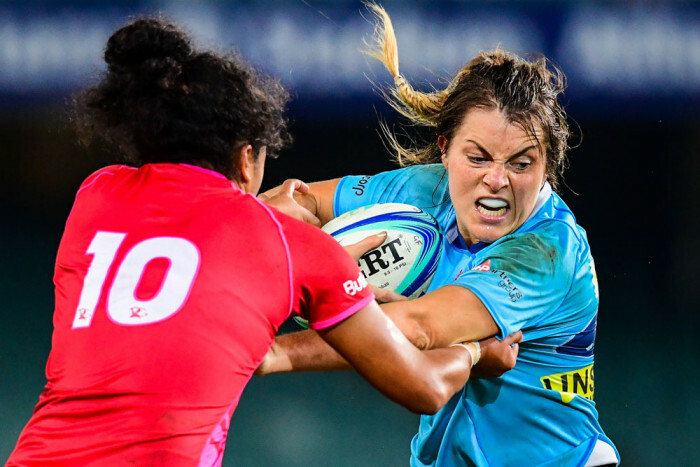 Unable to be separated after the first five minutes of extra time, NSW captain Ash Hewson sealed the win with a 15-metre penalty kick in the final seconds of the second period. The game began with early nerves from both sides, NSW got first points on the board 12 minutes in with a penalty goal off the boot of the captain, veteran Ash Hewson. The pressure at the breakdown was immense by NSW but Queensland withstood the threat and got their first score on the board and the first try of the game through player of the match Lavinia Gould in the 20th minute. Gould beautifully anticipated a NSW pass at the halfway line and intercepted it on the run, streaking to the line and giving the visitors a two-point lead. NSW struggled with the pressure being applied by the Reds in attack as the clock clicked into the final ten minutes before the break, but they applied pressure of their own in the scrum with the better structure and power. A positive from the first half was Hamilton who was effective in the contest for the Blues just as Queensland looked to have the momentum. NSW had posted a few early penalties on the stats sheet but Queensland’s count was also mounting as the half came to a close. Two penalty goal attempts by Hewson from directly in front of the posts in the final four minutes saw NSW retake the lead from the first kick but fall frustratingly short with the second. The hosts and reigning national champions headed into the rooms with a 6-5 lead at the break but aware they would have to reassess their game-plan for the second half if they were to stop the threat from their northern rivals. Queensland began the second half with continued intent and some massive hits in the tackles. Just seven minutes in and a wonderful 60m run to the line by Nareta Marsters saw Queensland retake the lead. Hargreaves secured the turnover out of the pack and got a pass off the deck to Marsters who headed for the line, fending off the opposition attempts to stop her and putting Queensland 10-6 up on the scoreboard. One of the key instigators of the Queensland power game was Wynona Baice who played 60 minutes of bone crunching rugby for her side before being clapped to the bench by the appreciative crowd. In a dramatic turn for Queensland, Lavinia Gould was shown a yellow card for offside having been warned by the referee several times. NSW were in the opposition 22 at the time of the send off and had the possession. In the following minutes the inevitable did happen and Melissa Fatu put NSW back in front by one point with a kick to come as she pushed the tackling pack over the line and went to ground with the ball. Hewson nailed the extras from close in and NSW went from four down to three up, 13-10, with less than 15 minutes to go in the final. Just like that NSW seemed to find their rhythm and went on the attack working their way up the field at a good pace of play. Gould re-entered the field of play for QLD with just seven minutes left to play. With the announcement by the referee that there would be four extra minutes of injury time when the clock went into the red, the action continued with NSW still holding a three-point lead. In the 81st minute QLD had a penalty and the bench was screaming for the kick to be taken as, in the event of a tie at full time, the game would go to golden point. Just a minute later, Temara had the penalty kick for the points to level the score at 13-13 and she did just that. NSW had effectively shut down Sammy Treherne and Lefau-Fakaosilea for the majority of the game which limited the opposition’s attacking play out wide, but Sammy Treherne would not give up and finally got some space to make a run up the sideline only to be tackled into touch just a metre short of the try line by captain courageous Ash Hewson, saving a game winning try. As the siren sounded to send the match into extra time, the players took time to catch their breaths and regroup. When the action got underway, NSW had the initial momentum and as they edged closer to the try line the crowd started to chant for the locals, but after 19 phases there was a knock-on and the whistle blew with scores still level after the first period of extra time. The players looked exhausted but were determined to get their respective teams a result. As the second five-minute period drew to a close, Queensland did the unthinkable and gave away a penalty deep in their own half. Just 15 metres out, Ash Hewson strolled up to Cobie-Jane Morgan to retrieve the ball and take the shot to win the game. NSW secured the win in extra time from the boot of its 37-year-old captain Ash Hewson – a leader to the end! Smiles spread and tears flowed as genuine appreciation was shown by both teams for their opposition for what had been an epic final and a great display of women’s rugby.